Please scroll down to read our cancellation and other polices. Kathleen and Peter would like to dedicate this website and bed and breakfast retreat in honor of the Hawaiian people, the ancestors of the land and Hawaiian elders that have blessed the land and the creation of the retreat. The Volcano Rainforest Retreat lodging experience on the Big Island of Hawaii offers visitors a collection of distinct guest cottages, created with elegant simplicity in harmony and balance with the Hawaiian rain forest. Its sense of place imparts a seamless feeling of connection between inside and outside, the accommodations and nature.The rain forest lodgings are interconnected by intimate paths, which wind their way through the misty, mossy landscape. This Hawaii Volcano retreat offers a unique setting for romantics, artists, nature lovers and world travelers seeking refuge and intimate contact with the living volcanic earth. The Volcano Rainforest Retreat Bed and Breakfast’s serene grounds and lodging were also developed to explore the potential for personal sacred living space as a healing art. Different massage and bodywork modalities with licensed massage therapists (LMT) and Hawaiian cultural practitioners are available by appointment. Check-in is between 3:00-5:00pm. Check-out by 10:00am. Call for early or late arrival, prior arrangements are necessary. Please keep in mind that if you are flying into Kona, you are 2 1/2 hours away from Volcano, and if you are flying into Hilo, you are 40 minutes from Volcano. Daily housekeeping service includes fresh food, towels, bed making, dish-washing and trash removal. If you have special needs, please let us know either prior to arrival or during your stay. We request that guests care for our property. In the unlikely event that damages occur during your stay, damaged or missing items fees may be applied, especially for our colorful linens, towels and robes. White towels are available for peroxide hair or skin products. Additionally, an ‘add on’ extra cleaning fee may be charged when a cottage is left in conditions that require extended cleaning time and attention. We will contact you to clarify any issues, and charge your credit card. Only the Guest Cottage and Bamboo Guest House have cooking facilities. The Retreat is available for small groups upon request. Rental Vehicle Necessary. No public transportation in this rural community. Please be aware that once a reservation is booked, dates are taken off the reservation calendar, saved for our confirmed guests and no longer available to other travelers, so our policies will apply. The Volcano Rainforest Retreat is 40-80% booked six months in advance, due to travelers planning ahead for their Hawaii vacations. Guests plan ahead to have their choice of dates and cottages. Thank you for your understanding. 80% Refund for cancellations made 60 days or more, prior to the arrival date, this includes the 20% cancellation fee. No guaranteed refund for cancellations received 60 days or less, prior to arrival date. 80% Refund only if dates can be rebooked, this includes the 20% cancellation fee. We do everything possible to rebook those dates. For any cancelled dates that cannot be rebooked, payment will be forfeited. 20% reservation adjustment fee will apply for any original dates that cannot be rebooked for changes made 60 days or more, prior to arrival date. 30% reservation adjustment fee will apply for changes made less than 60 days, prior to arrival date. No cancellation refunds are guaranteed at Holiday times, Rainforest Run and Merrie Monarch Festival. “We do everything possible to rebook any cancelled holiday dates. For any cancelled holiday dates that cannot be rebooked, payment will be forfeited. Thank you for reading over our link above to holiday times and festival dates, and please consider trip insurance”. For your financial security, in case of any changes and possible emergencies, including medical conditions,we recommend that all guests purchase travel insurance. Please note: We are committed to the safety of our guests. Volcano Rainforest Retreat has a Natural Disaster Cancellation Policy during times of volcanic eruptions, hurricanes and/ or tsunamis. Volcano Rainforest Retreat Bed and Breakfast is run by a property management team, owners, Kathleen and Peter Golden, our managers, and occasionally an on-duty property manager. Our management team cares for the guests and property daily, and when the Goldens are away. All manager contact numbers are listed in the guest cottage information binders. When occasionally off site, a message can be left on their phones. Calls will be returned as soon as possible. The on-duty manager’s phone number is also posted on the door of the Golden’s residence for questions or emergencies. When the Goldens are off island, the on-duty manager is at the Bed & Breakfast every morning and afternoon for a few hours, and stays overnight some nights out of consideration for our guests’ needs. Please respect the Goldens’ privacy at their residence. Call the owners and manager’s phone numbers posted in guest cottage binders. Guests enjoy their privacy and respect other guest’s privacy in one of four unique guest cottages on the Bed and Breakfast grounds. Just five minutes away, enjoy social interaction at Hawaii Volcanoes National Park and at cafes and restaurants in charming Volcano Village. We have a wonderful pet and companion cat, Lahi. She lives with the Goldens in their residence at the Volcano B&B and remains outside of the guest accommodations in consideration for visitors with allergies. Please let us know ahead if you have allergies to cats or feather pillows and comforters. We also appreciate guests informing us of food sensitivity requests a week or more before arrival, because that will make it more possible to meet special needs. When guests arrive at our Volcano Hawaii Bed and Breakfast, set on one and a half acres of stunning rain forest, they are warmly greeted and treated like ohana (family). 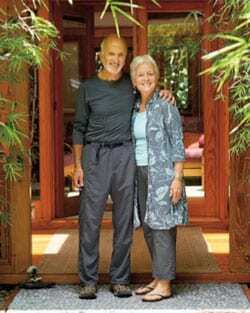 Like their visitors, Kathleen and Peter Golden also made a pilgrimage to the land of Aloha “once upon a time” in search of peace and beauty. Little did they know, when they left San Francisco in 1991 for the Big Island of Hawaii, that what was originally envisioned as their dream home location would evolve into a must-stay Volcano bed & breakfast destination. Land preparation on the original half-acre, near Kilauea Volcano, began in 1988, when Peter and his son, Joshua, used machetes to carve the first path into the dense Hawaiian rainforest. In 1995, after building their 12-sided house on the adjacent land, the Goldens opened their original home as a guest cottage to visitors traveling to Hawaii Volcanoes National Park. The creation of three additional structures as part of their personal living space gracefully evolved over 18 years as they conveyed their vision to local builders and craftsmen, building and weaving each living space into the landscape. Gradually, four separate hand crafted structures became a collection of bed and breakfast cottages. The Golden’s current home is also on the property where they enjoy sharing their creation and love of the land with the many visitors to the Big Island of Hawaii. The Goldens would like to express their gratitude to all those who work behind the scenes to care for the natural and man-made beauty at the Volcano Rainforest Retreat. By their on-going presence and service each staff person makes the bed and breakfast retreat a very special place, alive with heart and soul. Peter and Kathleen are especially grateful to Carolyn and Roby LaPorte of Wowi Zowi, Bed & Breakfast Hotel Website Designers, Website Internet Marketing. We especially appreciate their understanding of our artistic process in creating our bed & breakfast retreat. 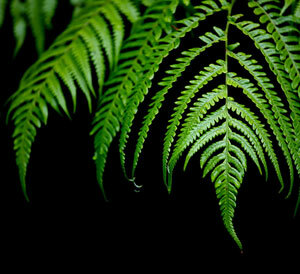 It is not just a business, it is our life’s work together… the expression of our shared love of life and the land. We are so grateful for their capacity to step into our world and convey the essence and unique sense of place of the Volcano Rainforest Retreat. Their brilliance and co-creative force in photography, design, and layout has allowed us to more fully share our inspired vision with the world. Special thanks to Anne Lee, who co-created the beautiful text and offered her creative, sensitive and artistic input throughout the entire development process.